Colombia’s President Juan Manuel Santos declared earlier this month that a controversial highway project that would cut through the Amazon will not be completed. Santos pointed at rampant deforestation and potentially irreversible environmental impacts to a sensitive ecological corridor near three national parks if the highway project were followed through to completion. The Marginal de la Selva highway is part of $1 billion infrastructure project that would have opened a trade route for heavy land cargo to pass from Venezuela to Ecuador through Colombia without having to enter the treacherous Andes mountains. The announcement was made as environmentalists decried a massive increase in deforestation in the region around the proposed highway project, which directly borders three national parks. Following a historic 2016 peace agreement with Colombia’s former largest guerrilla group the FARC, the power vacuum left by the demobilized rebels exacerbated deforestation as land speculators flooded into the area to clear tracts of forest for speculative cattle ranching and palm oil projects. 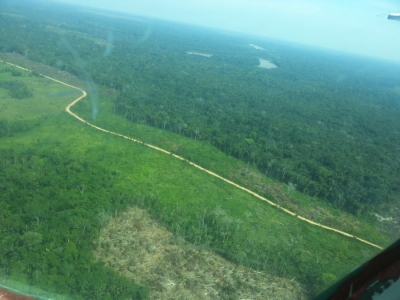 According to environmental government agency Corporation for Sustainable Development of the North-East Amazon (CDA), many of these speculators are connected to illegal armed groups. Wilfredo Pachón, local CDA Director in San Jose de Guaviare, said property values can increase up to three times over when the forest is cleared. He told Mongabay that much of this land sits empty after being cleared, with investors betting that the titles will be formalized later on down the line. Deforestation caused by land investors for speculative cattle and other agricultural projects is threatening the last remaining forest corridors in the Amazonian piedmont region that connects three of Colombia’s five regions: the Amazon, the Andes and the eastern plains. Rodrigo Botero, director of the organization Fundación para la Conservación y Desarrollo Sostenible (FDCS), who has been working in the northwestern Colombian Amazon frontier for the past six years, called the President’s announcement “extraordinary news for deforestation mitigation and restoration efforts” to restore the region’s ecological integrity. Botero noted that the president’s declaration hadn’t been codified by the Ministry of Transportation, which is needed formally withdraw the Marginal de la Selva plans. He said work must also be done on the departmental and municipal levels to align local development policies with the nation’s environmental agenda. In particular, Botero pointed toward palm oil expansion and petroleum extraction as potential threats to the region’s long-term ecological integrity. In addition to closing the Marginal de la Selva project, Santos recently announced a 1.5 million hectare expansion of the Chiribiquete Natural National Park. However, at the same time as the park’s expansion was announced, at least 40 fires were reported raging in and around the park. 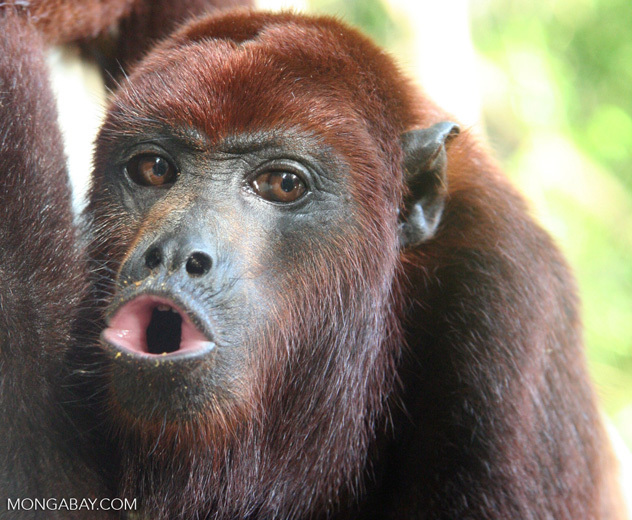 Image on the left: The Colombian Amazon provides important habitat for many rainforest species, such as the red howler monkeys (Alouatta seniculus). FCDS recorded 160,000 hectares of Amazon forest cover loss from the beginning of January 2017 until February 2018. The country’s climate and environmental monitoring agency IDEAM said that 70 percent of the country’s deforestation alerts are now happening in the Amazon. From December 2017 until March 2018, the Tinigua National Park alone lost of approximately 5,600 hectares of forest cover, according to government analysis. To address the deepening deforestation crisis, Botero said it’s critical that Colombia definitively closes the agricultural frontier in the Amazon to ensure the region is not further colonized or developed and to prevent land speculators from generating profits on rainforest destruction. Bill Laurance, a distinguished research professor and Australian Laureate at James Cook University in Australia, has been studying the deforestation effects of road development and infrastructure projects in tropical rainforests for the past 35 years. Laurance’s research has shown that building paved roads through tropical rainforests causes land-grabbing, illegal road development and accelerated deforestation — all of which have been observed as plans for the Marginal de la Selva highway proceeded. 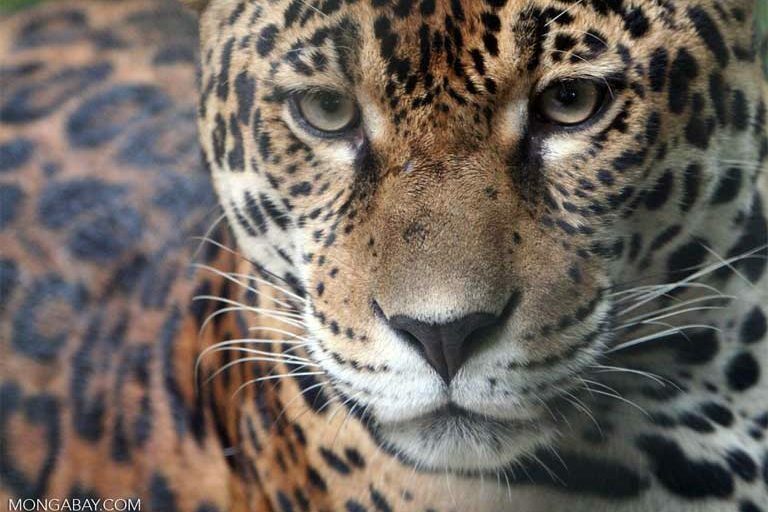 According to the latest research, the Amazon rainforest may be dangerously close to reaching an ecological tipping point where the rainforest ecosystem could rapidly degrade into a more arid savannah if deforestation reaches 20 to 25 percent.